From field work to the weight room, youth to professional athletes, as well as fitness enthusiasts have incorporated the DYNAMX™ TRAINER 2.0 into all phases of their general and sport-specific training with proven results. They seek to improve their performance by using our set to increase workload to their fast twitch muscles, core, joints, and lower body stabilizers through all ranges of motion: fueling advances in sports movements, such as acceleration, top-end speed, quickness, leaping, kicking, jumping, deceleration, rapid changes in direction, coordination, balance, stability, and lateral quickness. The DYNAMX™ TRAINER 2.0 bands—with optimized heavy gauge anti-snap design and 100% iron clips—provide a secure attachment that will not weaken over time. Designed for ease of use, allowing for a simple addition to any training regimen. Simply attach the comfortable neoprene thigh sleeves and preferred resistance bands and you’re ready. The thigh and ankle straps can be worn throughout training and the bands easily detach, allowing for quick transitions between resistance and non-resistance exercises. 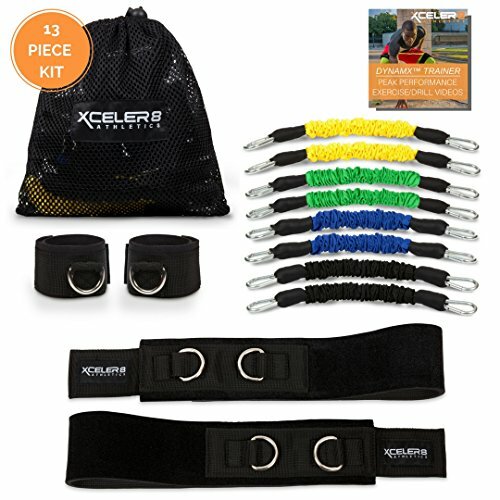 OPTIMIZE SPEED: Incorporate our durable Velcro straps and running resistance bands during your general, HIIT, and sport-specific training to increase lower body strength and mobility to your hips, knees, and ankle joints, allowing you to stride faster and farther for better acceleration and top-end speed. INCREASE POWER AND ENDURANCE: 4 resistance levels (10-35 lbs.) and optimized kinetic band length improve your explosive training, for better quickness, vertical jumping, leaping, lateral explosiveness, and kicking with less fatigue. ULTIMATE AGILITY: Using your bonus ankle straps fuels quick muscle reaction, core workload, and lower body stability to improve fast stops, rapid changes in direction, and acceleration. EASE OF USE: Simply attach our comfortable straps around your thighs, clip the resistance bands and you're ready to go. The straps were designed to be worn throughout your training sessions and our premium bands can remain attached, or easily clipped to the thigh straps' sides between different workouts. ONLINE EXERCISE & DRILL TRAINING VIDEOS | 100% CUSTOMER SATISFACTION | 12-MONTH WARRANTY: Use our PEAK PERFORMANCE exercise/drills online video library to help with your training. Take our videos on the go: every piece of content can be downloaded. If you are not 100% satisfied, return your purchase at any time. All parts are covered by a 12-month warranty; message us for details. If you have any questions about this product by XCELER8 Athletics, contact us by completing and submitting the form below. If you are looking for a specif part number, please include it with your message.